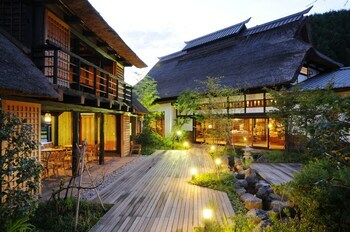 Located in Kawaba, Yutorian is in the mountains, within a 15-minute drive of Kichijyoji Temple and Kawaba Ski Resort. Featured amenities include complimentary newspapers in the lobby, multilingual staff, and a safe deposit box at the front desk. A train station pick-up service is provided at no charge, and free self parking is available onsite. With a stay at GLI Weekly Apartment Kyoto in Kyoto (Gion), you'll be minutes from Gion Corner and Kenninji Temple. With a stay at Hotel Taisetsu in Kamikawa, you'll be a 3-minute walk from Sounkyo Hot Spring and 6 minutes by foot from Daisetsuzankurodake Ski Area. Free self parking is available onsite. With a stay at Andaikan in Yamanouchi, you'll be within a 15-minute drive of Jigokudani Monkey Park and Shibu. The front desk is staffed during limited hours.